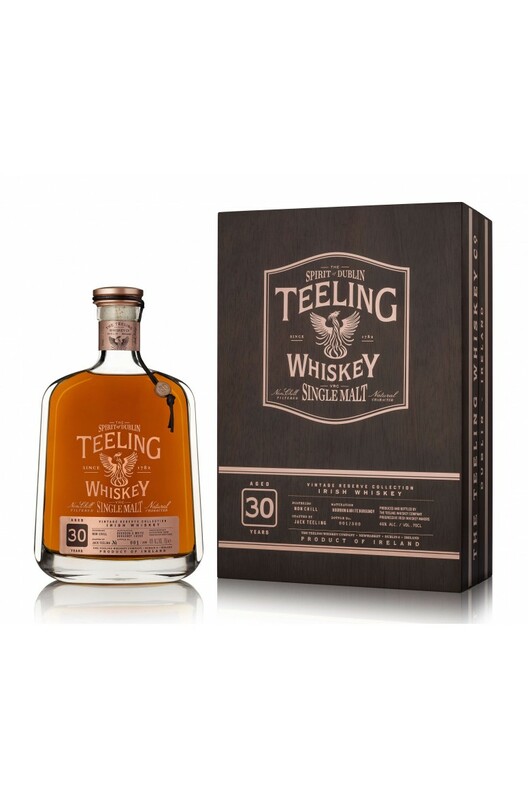 Limited to 500 bottles, the Teeling 30 Year Old Vintage Reserve bottling was initially matured in ex-Bourbon casks before being further matured in ex-White burgundy casks. Nose A big fruity hit with aromas of ripe apricots, honey, quince jelly, lychee, Muscat grapes, apple turnover, cinnamon buns, yeasty fruit bread, clove and orange. Amazing complexity. Palate Rich and mouth-filling with a waxy and oily texture. Some oak tannins add more texture and chewiness. Flavours of vanilla, cinnamon, allspice, honey, sultanas, pineapple, dried apricots, citrus peel and honey. Finish Very long with some white wine notes and tropical fruit persisting until the end.